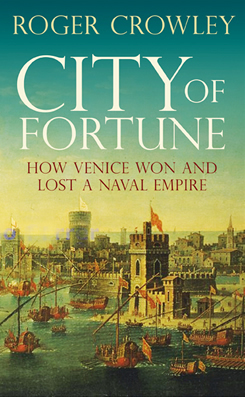 City of Fortune tells the story of Venice’s rise from lagoon dwellers to the greatest power in the Mediterranean. It was an epic five hundred year voyage that encompassed crusade and trade, plague, sea warfare and colonial adventure. City of Fortune is a rich narrative about trade and warfare, seafaring and piracy, and the places where Venetian merchants sailed, traded and died: Constantinople, Crete, Alexandria, the Black Sea, the Adriatic and the shores of Greece. It begins symbolically on Ascension Day in the year 1000 and ends with an enormous explosion off the Peloponnese in 1498 – and the calamitous news that the Portuguese had pioneered a sea route to India, strangling Venice’s lucrative spice trade.
" Roger Crowley makes a trustworthy and wonderfully eloquent guide ... Crowley is such a natural narrative historian, with such an eye for colourful but telling details and such a knack for dramatic character sketches, that he remains a constant joy to read." "In recent years Crowley has gained a reliable reputation as a confident, clear-eyed guide to the Mediterranean. In Venetian fashion he plunders the historical records and literary archives, setting them out seductively to display a teeming tapestry of Venetian bravura over half a millennium, from the years 1000 to 1500." "[Crowley's previous books] were notable for their lucidity and assurance and proved Crowley to be one of the best narrative historians currently writing. City of Fortune is of the same standard ... Crowley's accounts are spare but thrilling ... the rise and fall of Venice's empire is an irresistible story and Crowley, with his rousing descriptive gifts and scholarly attention to detail, is its perfect chronicler. For centuries, he notes, the republic's sailors returned home with "gold, spices, plague and grief" and in this compelling book, like a scrupulous Venetian merchant, he weighs out full measures of each." "...this book affords a perfect account of its subject. In terms of pace, colour and fluency, Roger Crowley's style is flawless, matched by his complete grasp of the motives - mercantile, political and ideological - driving Venetians across the increasingly tricky Mediterranean waters. Read him to discover what a muda was, how a bailo differed from a provveditore, and why our modern world has at least some of its roots embedded in the Adriatic mud on which this apparently implausible empire began." "Roger Crowley burst onto the scene six years ago with a stunning account of the fall of Constantinople in 1453....Military history is still his forte, and the book is studded with set-piece accounts of epic engagements..."
"Roger Crowley’s hugely readable, well-written and informative book – take it there with you this summer! – explains how the Venetian Republic grabbed the riches that built it...An expert on maritime empires and Constantinople, he conjours vividly the privations and horrors the Venetians endured in the name of trade...Crowley is excellent on all this – and in building our sense of anticipation of the empire’s end." " Roger Crowley has already written two excellent books, one about the siege of Constantinople in 1453 and another about the ­16th‑century struggle for mastery of the Mediterranean between various Catholic maritime states and the Ottoman Empire. Now he has added a third to the list...Crowley is a wonderfully lucid and enchanting writer who shines at siege warfare and combat operations but he is equally skilled in expressing the essence of Venetian economic power. His narrative is laced with references to business practice that never seem forced or inapt." "This highly readable account of the city...it entertains as much as it informs – ideal holiday reading on a Mediterranean cruise." "a stirring account... An action-packed political and military history. " "...a rousing, traditional account that emphasizes politics, war, and great men ." "...the gripping story of how Venice carved out its empire in the eastern Mediterranean and how the Ottomans seized it piece by piece." "a fine eye for a set piece. He writes with a racy briskness that lifts sea battles and sieges off the page, so much so that at times his sentences seem in danger of bursting their seams...judicious, detailed accounts of Venice’s legal system and colonial policies, pepped up with grisly tales of enemies hacked, impaled or roasted alive. The grand story is enlivened by a wealth of well-chosen quotations..."
"Roger Crowley chronicles the peak of Venice's past glory with Wordsworthian sympathy, supplemented by impressive learning and infectious enthusiasm." " The rise and fall of the Most Serene Republic of Venice is one of the most dazzling and extraordinary in history, and Crowley makes a wonderfully eloquent guide. The story, from Ascension Day 1000 to around 1500, is a large and diffuse one, but Crowley is such a natural narrative historian, with such an eye for colourful, telling details and such a knack for dramatic character sketches, that he is a constant joy to read...Crowley is at his evocative best describing the extraordinary range and riches of Venetian trade in its heyday. Yet Venice was also central to the Fourth Crusade of 1202-04, and the book gives us a cinematic view of the siege and sack: machines like bellows spewing huge gouts of “Greek fire” (the medieval equivalent of napalm). " " Roger Crowley follows up his superb history of the Mediterranean with this fascinating study of the rise and fall of one of the major players in the region, the city-state of Venice. " "City of Fortune is not just an account of ships moving material around the globe. There are descriptive details of the battles and campaigns associated with the Crusades. Crowley describes the effort in vivid detail, including how ships were dismantled to make military attacking machines.... From the first discovery of far-away markets to the clash between Christianity and Islam, Venice had a major role in the conflicts of the time. In many respects, the impact of those conflicts are still felt today. City of Fortune places those events in their proper historical context through Roger Crowley's engrossing narrative." Hungarian rights in Roger Crowley’s City of Fortune. 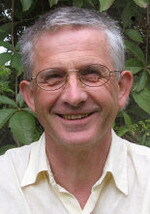 Romanian rights in Peter Padfield’s biography Donitz. Portuguese rights in Hitler’s Forgotten Children by Tim Tate and Ingrid von Oelhafen. Polish rights in Casey Watson’s memoir Runaway Girl.